Steam green beans for about 5 minutes and set aside. Gently rub both sides of the fillets with salt. Place them on a heatproof ceramic dish. Place dish onto a steamer over several inches of boiling water and cover. Gently steam fillets for 10 to 12 minutes. Remove ceramic dish from steamer. Sprinkle green onions and drizzle soy sauce over fillets. Heat peanut and sesame oils in small skillet over medium-high heat until they just begin to smoke. Then carefully pour on top of fillets. Use caution, because hot oil will cause onion and residual water on fillets to pop and spatter. Arrange green beans around fillets. 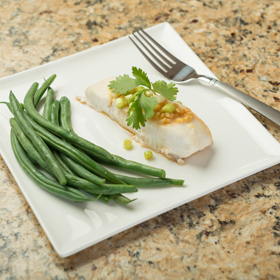 Garnish fish with cilantro and serve immediately. Serving size: 1/4 of recipe. Amount per serving: 200 calories, 7g total fat (1g saturated fat), 8g carbohydrates, 26g protein, 4g dietary fiber, 410mg sodium.